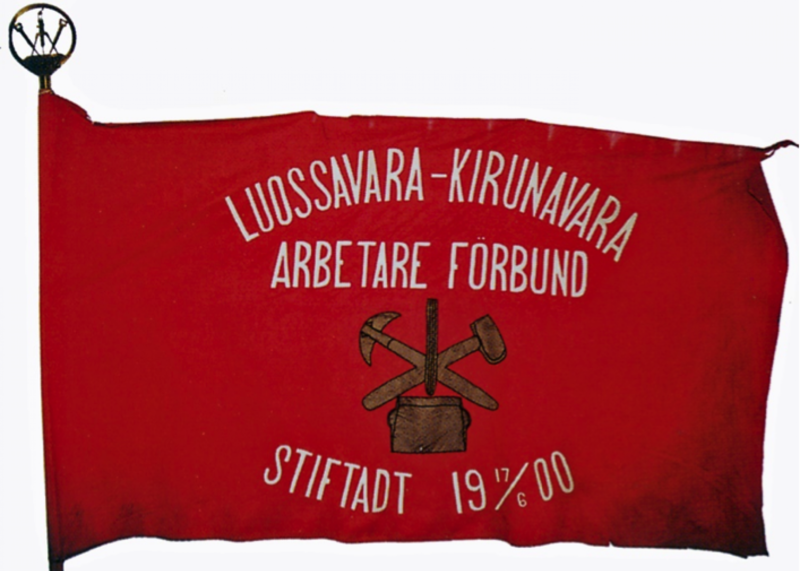 Luossavara-Kirunavara Workers’ Union – the organisation that eventually became the Miners' Confederation’s 12th Division – was formed in 1900 and, after two years of operation, acquired this banner, which is probably the inaugural emblem of their association. Previously, they had a demonstration banner with the association's name and foundation date. 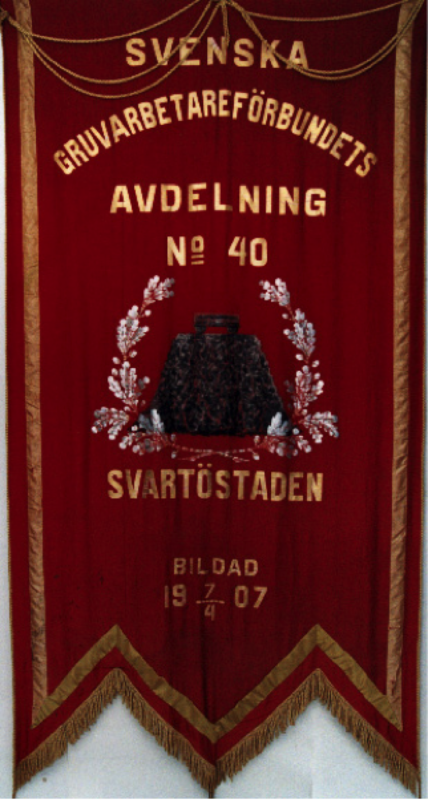 The Swedish Mining Industry Workers' Union's 4th Division in Malmberget acquired this banner in 1933, decorated by the banner-painter Johan Adolf Hellberg (1871–1935) in Torshälla. Their first banner was inaugurated already in 1897, but was lost in the great Folkets Hus fire in Malmberget in 1953. 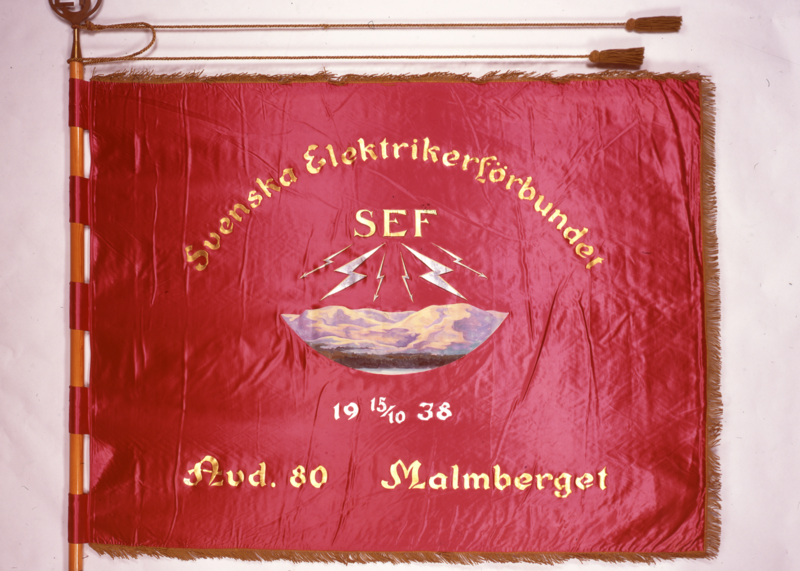 The 80th Division of the The Swedish Electricians’ Federation in Malmberget first flew this banner in 1954. 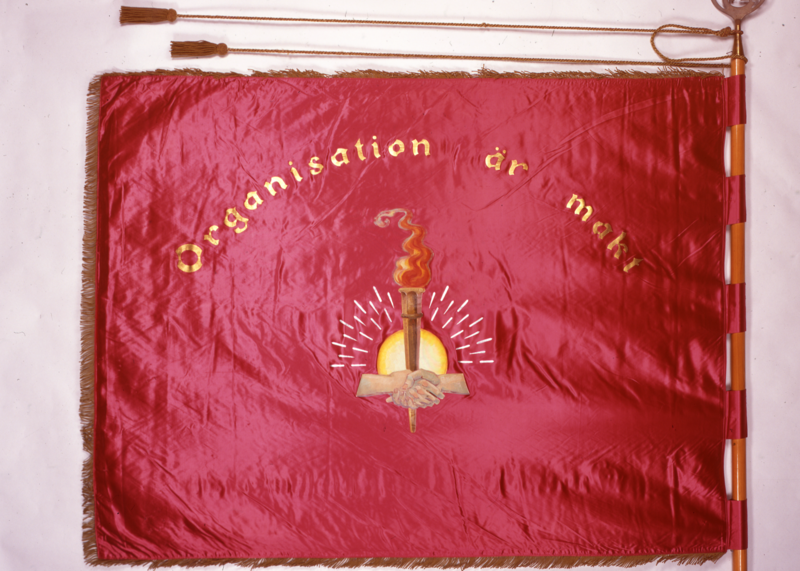 On the red cloth, local symbolism is paired with the lighting rod associated with the trade. The nearby mountain Dundret is pictured with the emblem of the federation above. Its backside bears the dictum “Organisation is Power” over a hand holding a torch with a sunrise in the background. 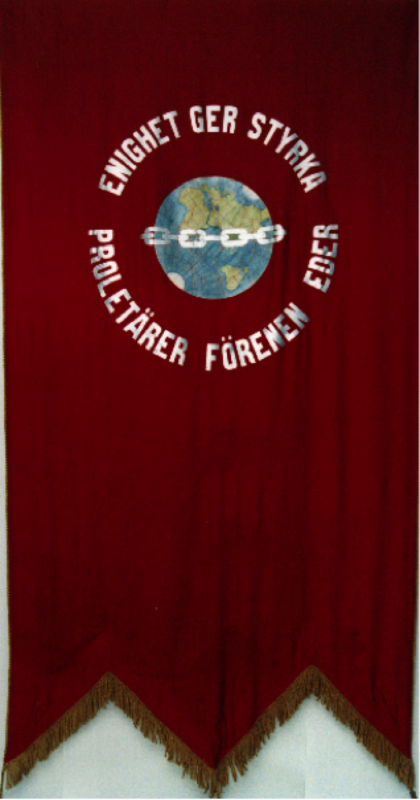 The banner is made at Lindblad’s flag studio in Örebro. The Miners' Union’s 40th division in Svartöstaden, whose members work in Luleå’s ore harbour, introduced its ensign one week before the first of May in 1908. It shows a mining carriage framed by a wreath of oak leaves. The adages on the back read “Unity gives Strength” and “Proletarians Unite” in a circle around the earth. 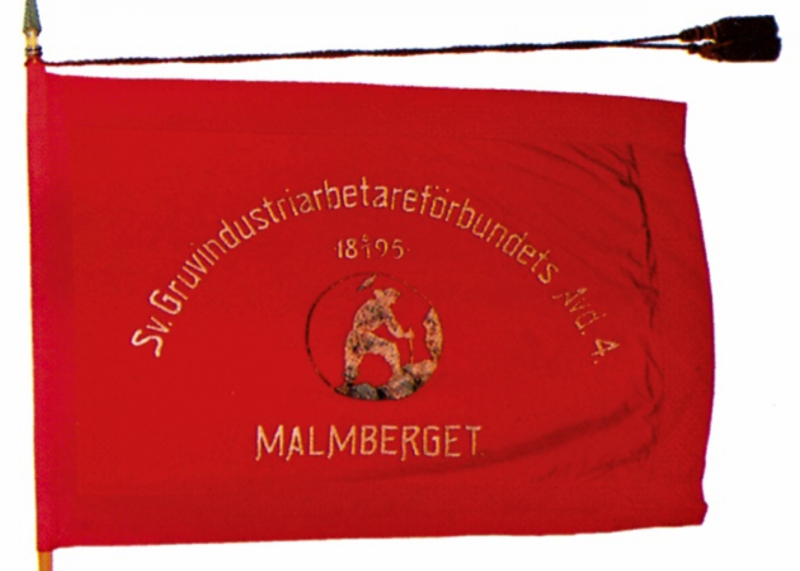 The researcher Margareta Ståhl has made a summary of banners from the turn of the century, which are filed in various departments belonging to Gruvarbetarförbundet (the Miners' Confederation). The text closely resembles an inventory, something that Margareta Ståhl spent many decades devoted to at the Swedish Labour Movement’s Archive and Library. She is Sweden's premier banner expert. Read more in ”Vår enighets fana: ett sekel av fackliga fanor” (1998), LO, 1998, and “Vår fana röd till färgen: fanor som medium för visuell kommunikation under arbetarrörelsens genombrottstid i Sverige fram till 1890” (1999), Linköping: University of Linköping, 1999.